Khamsum Yulley Namgyal Chorten was constructed about 9 years ago. The process of construction was done by some notable Bhutanese craftsmen including sculptors, painters and carpenters. It is located in the puankha valley and was builtg by Her Majesty Queen Mother in dedication to the welfare and security of the country’s all living beings. 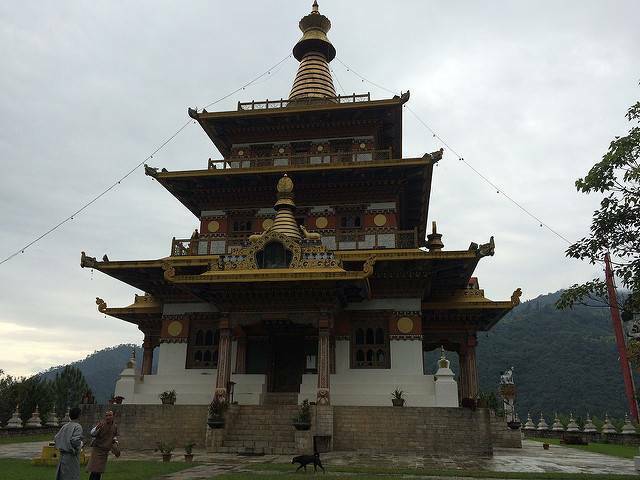 The temple can definitely be placed as an instance of one of the finest piece of Bhutan’s artistic traditions. There are small chortens built around the temple. From the top of the temple, you can get some beautiful view of the Punakha Valley. The temple is one of its kind in the world in accordance to its architecture. You have to drive for 30 minutes from the Punakha dzong and then you have to cross the Punakha suspension bridge. On the way to this temple, you will find some green rice fields that look amazing. But you won’t be allowed to take any pictures inside the temple.